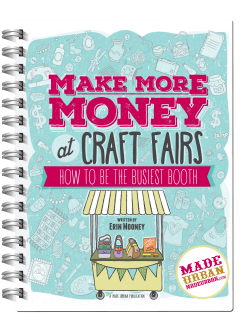 It's an extremely helpful section from the ebook MAKE MORE MONEY AT CRAFT FAIRS. And you'll discover the one element so many handmade business owners brush aside that can take an ordinary product to extraordinary levels. Enter you name and email address in the form below and then check your inbox (or spam folder) for an email from Made Urban. Once you confirm your email address, you'll instantly have access to the sample chapter, for free. It's been downloaded by over 10,000 people...I hope you enjoy it as much as they have!